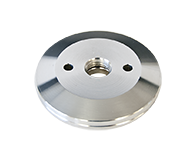 Steel and aluminum end flanges are used to secure metal center wheels to the arbor shaft on polishing lathes and equipment with the combined use of a shaft nut. 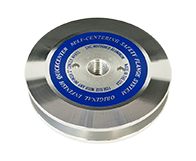 Infinish Quickcenters are a custom designed flange set that provide a quick-change system when mounting metal center buffing wheels to portable power and air tools with a 5/8”-11 threaded arbor. They are self-centering meaning the inside 3” center section of the top and/or bottom is raised to fit inside the clinch ring. This allows for tool-less installation, quicker mounts and dismounts, smooth and secure operation, and eliminates the need for a center reducer plate.